This book is an indispensable guide to achieving creative success by one of the world’s most influential figures in advertising. With passion, punch, and in-your-face writing, the legendary George Lois explains, demonstrates, and ultimately teaches us to discover our creative potential. His words offer new insights into, and continue to inspire, creativity. 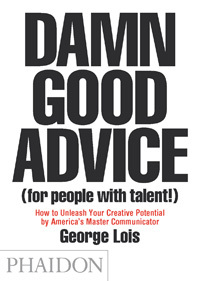 All images are courtesy of George Lois, from Damn Good Advice (Phaidon Press). Copyright © 2012 Phaidon. All rights reserved.